Winnipeg comedians are finding more ways to make audiences laugh with a live game show called Pants on Fire, where teams try to call each other’s bluffs. The goal for performers is to guess whether the opposite team is lying in each of three rounds. In the first round, each team member takes turns reading a statement off a card and answering questions from the opposite team. The questioning team then decides if the comedian is lying, and the truth is revealed. 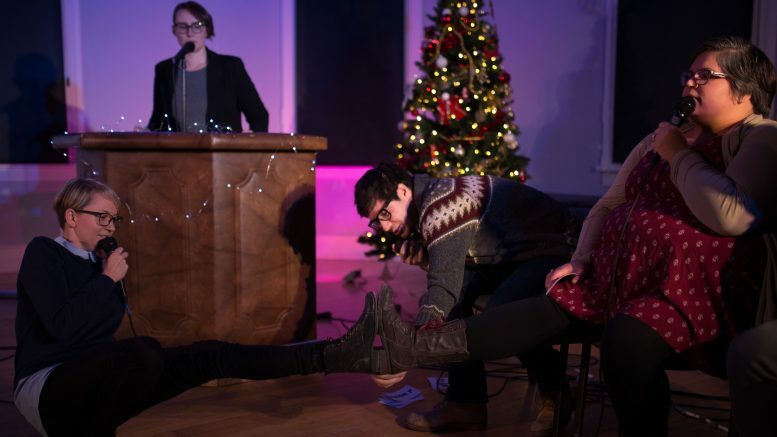 For their most recent show on Nov. 28, Angie St. Mars from local sketch group President Bear comedy, and Aaron Pridham of Free Snacks comedy faced off as captains of their respective teams. Also playing the game were comedians Elissa Black Wolf Kixen and Aaron Merke, who joined Pridham’s team, while St. Mars had Jesse Bercier and Johanna Burdon on her team. The evening was hosted by RobYn Slade of Outside Joke. “I like the concept of lying through your teeth and trying to make it believable,” Kixen said about the evening. “Just because in society […] it’s such a taboo subject, of lying and not lying, in the instance of a game where you’re supposed to lie and make people believe your lies, it goes against everything you’re morally taught,” Kixen said. In the second round, a person’s photo is shared on the projector for all to see, and each team member has to explain how they know this person. The opposing team then asks questions to determine who is telling the truth. The third round is a speed round, similar to the first but team members are only permitted one question. Paul Little is the co-producer for the show, alongside Leah Borchert. “I thought right away, this could work in a live format, and it could be tweaked and work really well especially with improvisers, and other comedians,” Little said. He said he began to share the idea until enough friends wanted to be involved that it became possible to produce. The first edition took place on Aug. 17, 2017. Little says they are hoping to host the show on a monthly basis. “I think it’s a good way to see a bunch of different comedic perspectives in one big hour show,” he said. Kixen said she appreciated the format of the show, and that she would participate again.